Blondies Do Not Have More Fun, At Least When They’re With Me. I Know That’s An Awful Title, Please Hear Me Out Anyway. I posted this on Facebook a while ago to express how I’ve been recently. There really aren’t any words that could do my feelings justice in quite the same way as the following clip. Nothing else to say, really, because that about says it all. Friends, it’s a stressful time. I know I’m usually kind of shady about what’s going on, but that’s usually because I’m not totally sure. This time around is not much different. We’re packing up our abode and will be out by the end of the month. Where to, you ask? That hasn’t really been all ironed out yet. And therein lies the problem. Ok, don’t fret lovely people: I’m not going to be Homeless Sad Shibow. It doesn’t have the same flow that “Sad Shibow” does, and anyway I’m a delicate flower and would be eaten alive by the outdoors faster than you could say “Hey loser, could I have that rad icing decorator of yours since you sure as hell won’t be using it anytime soon.” So, no, I won’t be homeless, simply because this body ain’t built for it. 1. Lots of monies. They can be in American dollars or Canadian dollars. Probably Canadian dollars because they’re made of maple syrup. 2. My own bakery. Maybe not. Probably not. Maybe a cafe? But one that’s not that busy. But it still has to generate lots of maple syrup. So as you can probably tell, that was more of a stream-of-consciousness exercise than it was a plan. In truth, I’m not sure how much I believe in plans, since things never work out quite the way I expected them to anyway. Alls I’m saying is…oh hell, I don’t know. 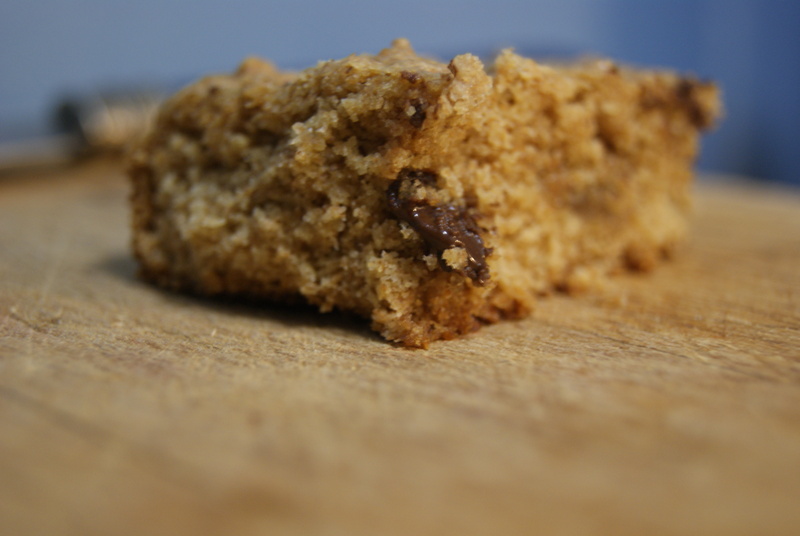 Want to hear about the blondies I made? Yeah you do. 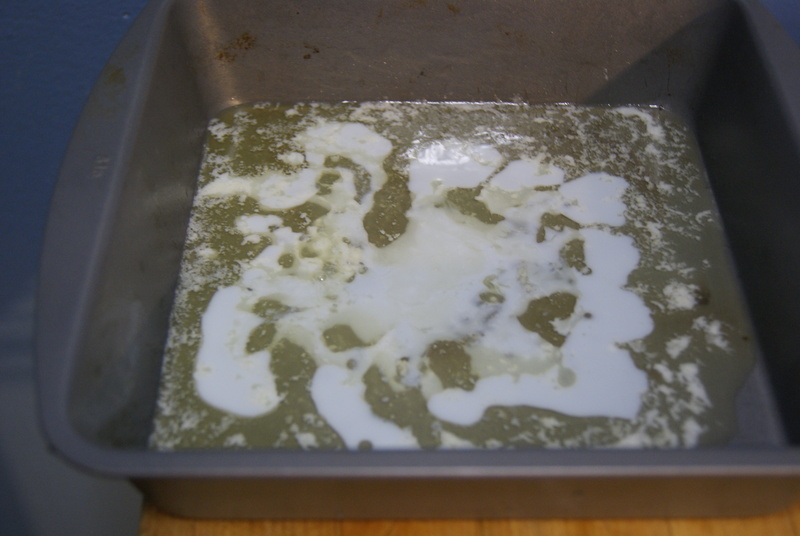 Preheat oven to 350°F and grease an 8×8″ square cake pan. In a medium-sized saucepan, heat butter over low heat until fully melted. Stir in milk, sugar, beaten egg and vanilla. What happens when to try to mix the ingredients directly in your pan. It was a bad day…and a bad idea (but pretty!). When completely mixed, pour into a large bowl and add in the flours, baking powder, and salt. 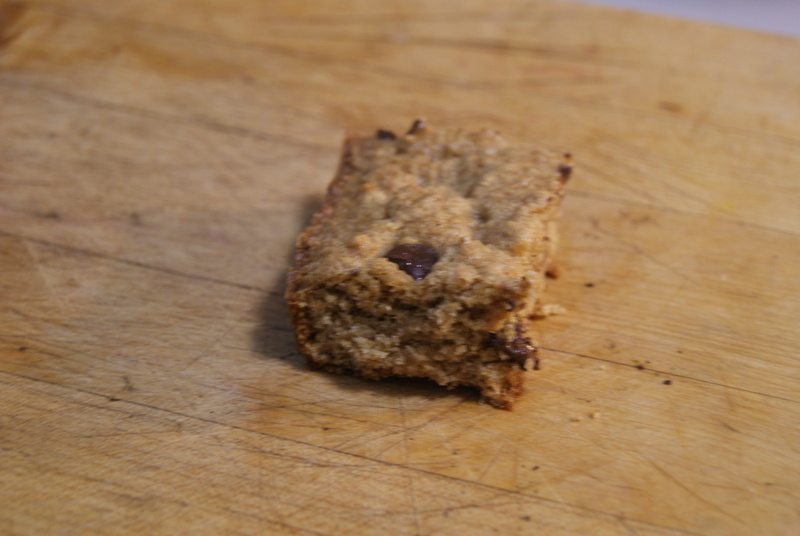 When you have your batter, fold in your chocolate chips and spread evenly in pan. Send into the oven for 20 to 25 minutes, until the top is golden brown. Cool in the pan for 5 minutes, then invert and leave on a separate surface until completely cooled. Then, cut into 16 square bars, get a glass o’ milk ready, and go to town. ← I Created A Monster. I Tried To Stay Away From The Monster. The Monster Was Too Delicious, So It Won. And Then I Won.